Yes. OK. 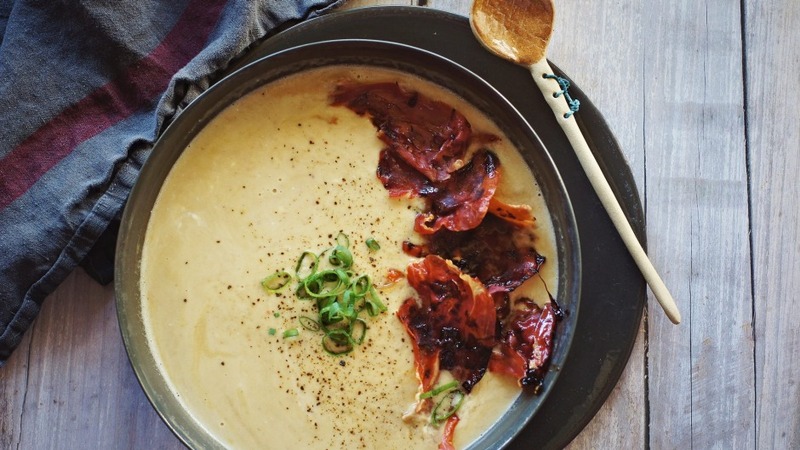 The world hardly needs another potato soup recipe but the double-down of bacon and prosciutto with a hint of white wine is definitely worth adding to your soup-making rotation. Preheat the oven to 185C. Place the leeks and olive oil in a roasting tray and toss to coat. Roast the leeks until they are soft and lightly charred at the edges (about 30 to 45 minutes). While the leeks are roasting, fry off the bacon in a small frying pan until crisp. Set aside to cool. Allow the roasted leek halves to cool before adding to a saucepan with the potatoes, bacon and chicken stock. Season to taste, bring to a simmer, cover and cook until potato breaks down and soup thickens (about 20 to 25 minutes). While the soup is simmering, add the balsamic vinegar and brown sugar to a small bowl and stir until sugar dissolves. Place the prosciutto slices on a baking tray lined with baking paper and drizzle over the balsamic mixture. Roast in the oven for 10 minutes or until crisp, and the balsamic mixture has caramelised. Once the soup has thickened, add the white wine and cook for another 5 minutes. Turn off the heat and stir through the cream. Blend the soup using a hand-held blender (or in a food processor in batches) until mostly smooth – some texture of the bacon should remain. Season generously to taste. Pour soup into bowls, and top each with a few slices of crisp prosciutto and a pinch of sliced spring onion and serve.